Belarus is a much forgotten country in the heart of Europe: a dictatorship, which has a rich but troubled Jewish history. Once part of the Soviet Union, pre-war Belarus boasted a large and vibrant Jewish community and claims many Jews of renown from Menachem Begin to Michael Marks of Marks & Spencer. The Jewish population was decimated by the Holocaust, but even beyond 1945, Jews suffered. Religious oppressions continued after the war as religious life was banned under communism. Being a Jew in the Soviet regime was very difficult. Today in Belarus, there is Jewish life, but this comes in the form of small isolated communities. The Together Plan Charity, based in the UK, works with communities to help them learn how to self-develop. We help to build links, and offer education, and as a result the communities feel less isolated and more empowered. 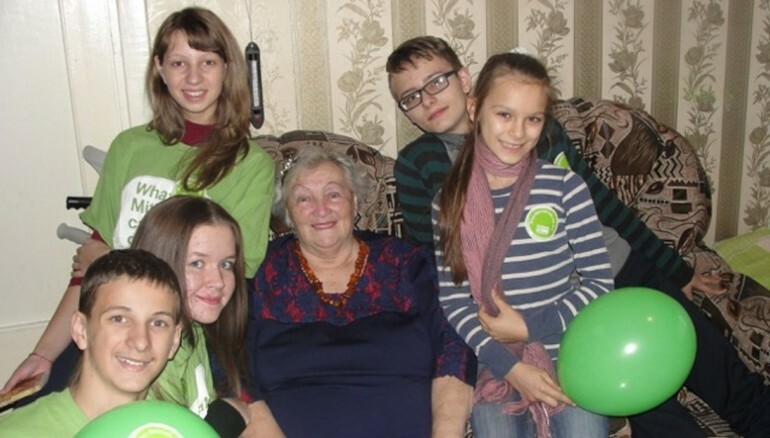 This year, for the first time, we introduced Mitzvah Day to the communities we work with in Belarus. This was hugely positive. It was a fantastic way for the communities to feel a part of something global, to feel connected to the wider Jewish world. For years people in Belarus have only known dependency. Through the work of The Together Plan, we try to change that mind-set to encourage independent thinking, and Mitzvah Day was a great vehicle to endorse that message. In the UK, The Together Plan runs a humanitarian aid project where we take donations of clothes, shoes, toys, medical aid equipment and educational resources and we have a team of volunteers who sort and pack these goods. We then send them by road to Belarus. But in Belarus we use the project as a community building tool, encouraging members to participate in the distribution, helping to get the aid to the elderly, the most disadvantaged in the communities, the disabled and those living below the poverty line. In the past the communities in Belarus have only been able to watch as we take donations in the UK on Mitzvah Day and run our packing sessions. This year, they didn’t watch, they participated and were fully involved. In Polotsk, as part of their Sunday School, children made gifts to give to pupils at a nursery for children with special needs, and then visited the nursery to present their gifts. In Bobruisk, community members visited the Jewish cemetery, removing overgrown weeds and shrubs and carrying out maintenance to the graves. In Minsk, younger community members visited survivors of the Minsk Ghetto who are currently in hospital. In Gomel, Hatikvah School, the only state Jewish school in Belarus, benefitted from maintenance work carried out by community members. In Slutsk (pictured), the children visited elderly or disabled community members, providing entertainment, the opportunity for conversation, and relief from their isolation. In Belarus, there is a lot of work needed to help people understand what it is to be Jewish. To build back traditions that were destroyed by the Nazis and supressed by the Soviets. To teach what a mitzvah is and how it is an intrinsic part of who we are as Jewish people. And there is no better way to learn about mitzvahs than to do them.